Now, you might be saying, where the dickens is Bamfield?! So I will give you a map so you can orient yourself. Located in the heart of Canada’s Pacific Rim National Park, nestled in a protected inlet on the south shore of Barkley Sound, Bamfield was originally created by the Huu-ay-aht First Nation. This rough little neighbourhood is made up of people who are tough and self-sufficient enough to survive within this stunning remote wilderness. Wi-fi is spotty and often MIA. My host had even taped a spot on the front window sill with an arrow where to place your phone to get wi-fi. Everything has to be brought up by boat or over an evil logging road that has been known to take out a few of those wussy city SUVs. If you are an outdoors person, this place is your mecca! It is the beginning/end of the infamous West Coast Trail and being in the middle of the Pacific Rim National Park means you get an outdoor playground of epic proportions. When I landed at the East Dock I was delighted to discover that my Airbnb was at the end of the dock to the left. Which meant I didn’t have to lug my bags up that cruel looking hill ahead of me. The house was two stories and right on the water. It even had its own dock! I was blown away by this place. It was older and a bit shabby, living by the water does that to people and houses alike. But it was clean and comfortable and the living room and bedroom opened up onto a wrap-around deck overlooking the water. I spent the rest of the evening out there drinking wine and reading until the cold drove me inside. The next day I decided to go for a walk. The weather report said it was safe till late afternoon, I couldn’t possibly be that long… could I? I headed out to find the beach my host had told me about. Well I kept wandering off the road, thinking I would try different routes… the map I had was less than accurate. I got it into my head that if I took this other road I could meet up with the West Coast Trail and then walk back to the beginning where the beach was, allowing me to claim I walked the Trail. Yeah, no. After slogging along in the sun and heat for about 30 minutes the mission was downgraded. Doubling back I continued on the original course. Fascinating trees – alive or dead. Twenty minutes later my map suggested I should turn right. Ok… another 20 minutes and I am second guessing my decision. Finally I flagged over a woman driving by and she said there was no beach down that road, the only one she knew of was the one at the beginning of the WCT. She kindly gave me a ride back to the original road. Onward I trudged, too stubborn to turn back. Soon another car came by going in the same direction and when the driver saw who I was, he slammed on the brakes – it was my hosts! Thankfully they gave me a ride right to the beach! Whew, cause I was really running out of steam. 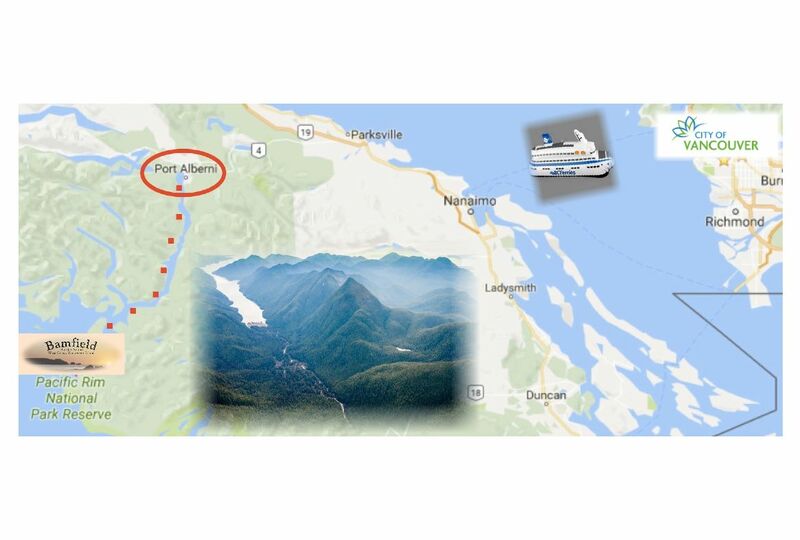 To get to the beach you have to go through the Huu-Ay-Aht First Nations land including the village of Anacla. 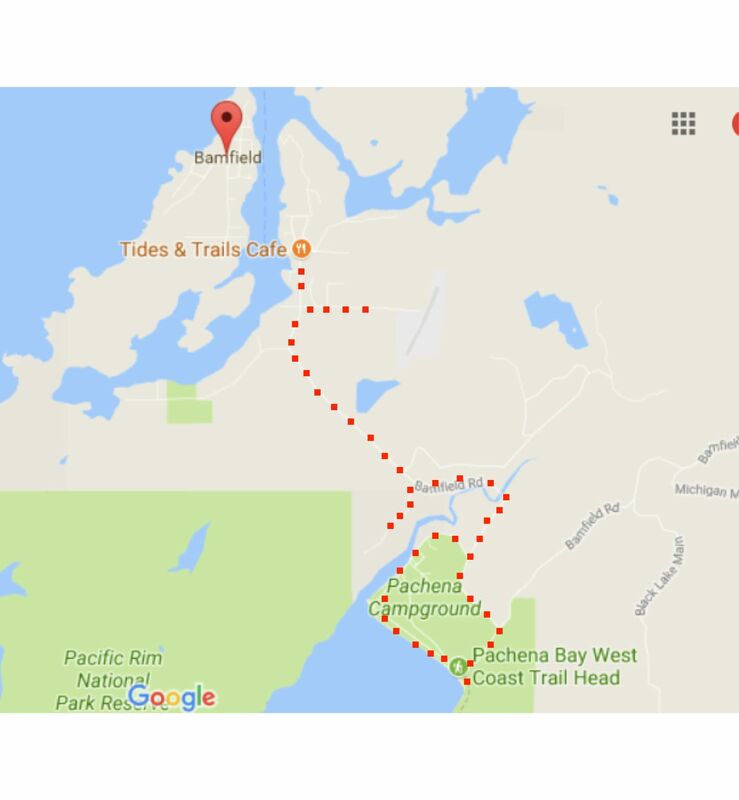 They have the amazing Pachena Bay Campground, which is snug to the beach! If only Bella (my Miata) could make it up those roads! “Ancient Spirit, Modern Mind” Love it! Small but perfectly formed poles. The beach was so worth it! So quintessentially west coast – wild, empty (mostly) and the only noise was the crashing waves. Man, I wish I had more time there. Aways startling when flowers flourish in sand. Must have been a big fish that didn’t get aways! Is there any wonder I had sore feet?! It took about 2 hours to get to the beach and about 45 minutes to walk back to Bamfield.. of course, the woman who gave me a ride earlier happened to be driving by so she gave me a short ride to her turn-off. By the time I was in sight of the village, my feet were in such a hurting state of mind I had to finish bare-foot. 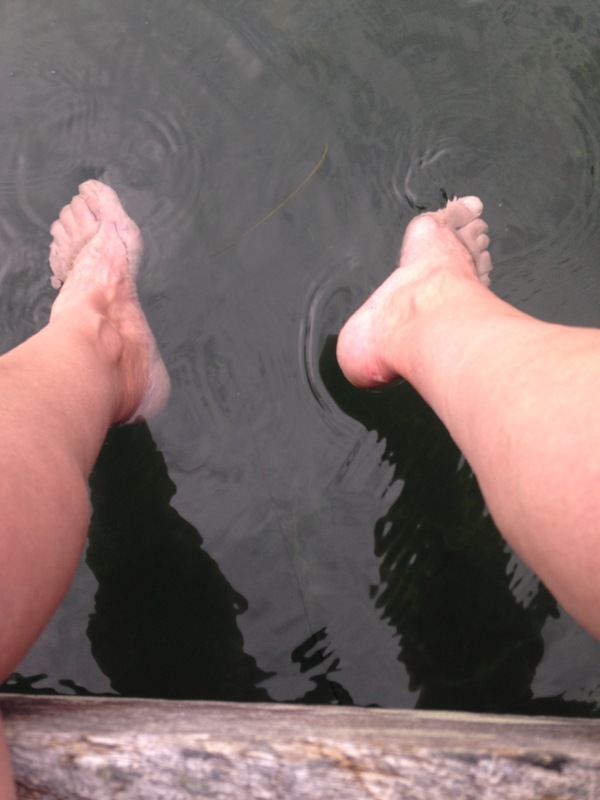 That’s when my dock came in handy to soak them when I got back. ouch. When it started to drizzle I went in, lit a fire in the fireplace and listened to the rain. It was a good evening. If you ever go to Bamfield I can’t emphasize enough to bring your own food and especially your own wine. Seriously. There is one corner store which seems to only stock white crap from the 1950s. I have more fresh vegetables in my crisper right now than they had. The restaurant wasn’t open until Thursday morning. The pub did sell food, mostly anything fried. I think it is a bit better in the summer season, but I can’t imagine by much. Wednesday evening I had dinner at the pub and there was going to be a live band later and I was tempted but was exhausted from going up and down random roads all day. Instead, I binged watched dvd movies like Minority Report and drank wine, wild woman that I am. Thursday I shuffled up to the finally opened cafe to have breakfast, bleh. Should have stayed home and had rice cakes. Bamfield is not for foodies, just say’n. 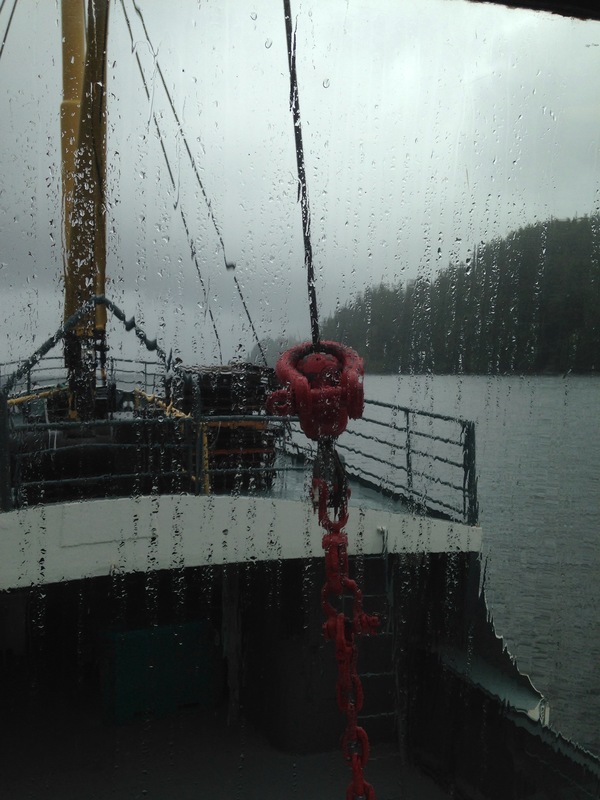 As I waited for the Francis Barclay the rain picked up steam and by the time we left the shelter of Bamfield it was pounding down. What a difference a couple day makes! The 10 passengers on board mostly huddled inside, napping and reading. In a couple of hours we met up with another boat and 4 divers from one of the resorts boarded. I hung with Bob, an ambassador for the City of Port Albernie is charged with chatting with tourists and being available as a local resource for them. It is a great idea and he was perfect for the job being an affable chap. When we landed at Port Alberni I had to bolt for the Crofton ferry to Salt Spring Island and the next stop on my Vancouver Island Adventure. I made the last one!